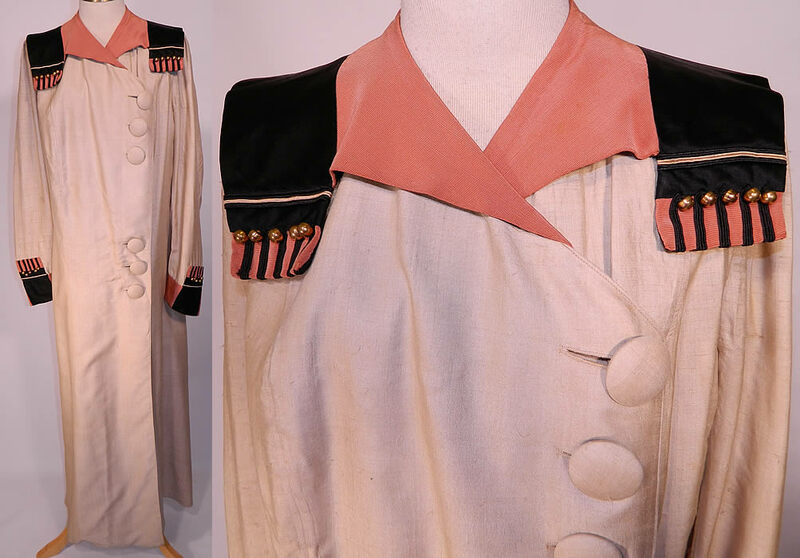 This Edwardian era vintage Strawbridge Clothier raw silk travel driving duster coat dates from 1910. 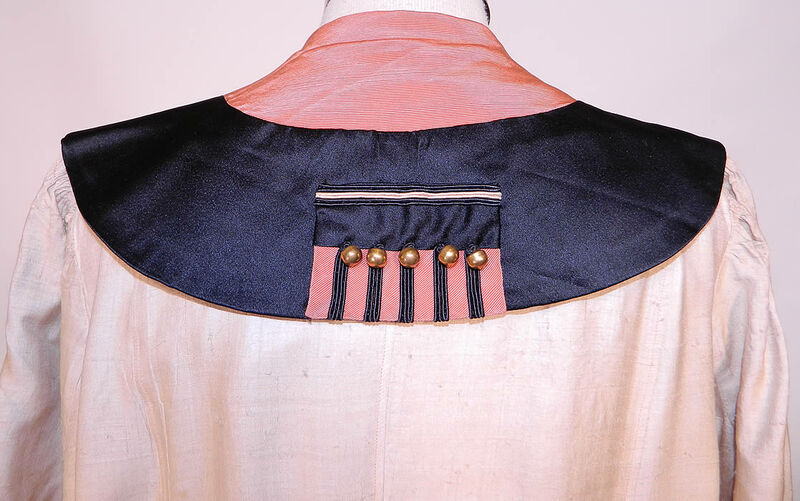 It is made of an ecru color raw silk fabric, with a salmon color pinkish orange silk grosgrain ribbed fabric and black silk satin collar and cuffs, with brass button studded trim accents. This classic women's long loose fitting floor length duster motoring coat jacket has a large rounded collar with epaulette shoulder style decoration, long full sleeves, a kick pleat slit back skirt and large silk covered buttons for closure along the front side. 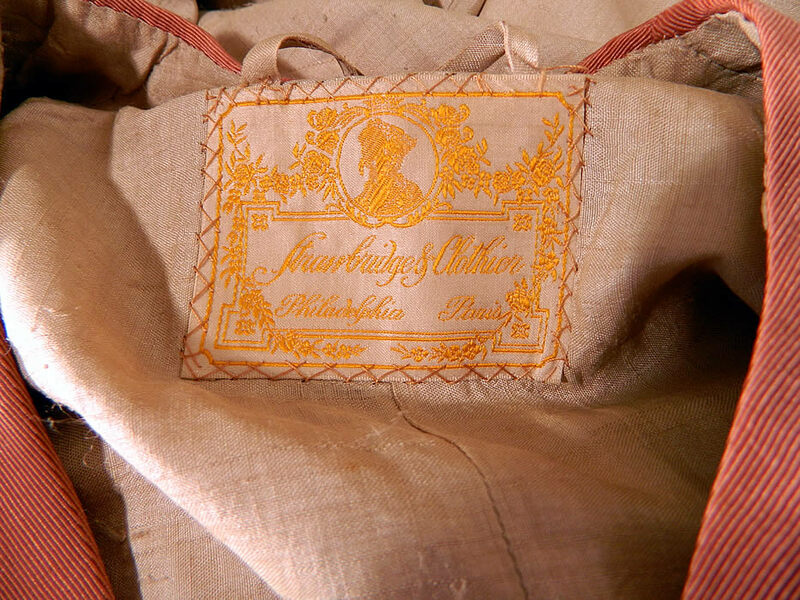 There is a "Strawbridge & Clothier Philadelphia Paris" department store label sewn inside. The coat measures 55 inches long, with 40 inch hips, waist, bust, a 14 inch back and 26 inch long sleeves. 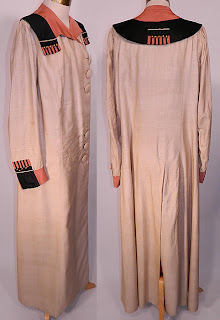 This coat would have been worn to protect ones clothing from the dust and mud when traveling, riding and driving in a motor car. It is in good clean wearable condition and is a wonderful piece of early motoring textile art! I'm giggly over the pink and black details!